Comment on the podcast by Professor Hanushek for Sense and Sustainability. Here are some of my thoughts on a podcast on the economics of education given by Professor Hanushek to Sense and Sustainability. They’ll be going up on that site soon but for the moment read on if you’re interested…. Check out the S&S website and podcasts too. There’s some brilliant stuff on there. In his podcast on Monday, Professor Eric Hanushek extolled the merits of incentive based pay in education. This post critically reviews his claims, arguing that, although raising the quality of teachers is a key challenge for policymakers, performance pay is not the most effective mechanism for achieving this end. The nature of teaching jobs should be transformed, rather than just their pay. Channels for career development within the education system should be created as a means of attracting the most ambitious, able individuals. Employment contracts must also be reformed to remove poor quality teachers from classrooms, quickly. Teachers matter but how much is not clear. Hanushek starts from the premise that teacher quality matters for educational outcomes. On the face of it, this claim is uncontroversial. However, the quantitative significance of the effect is not as clear as presented. There is debate surrounding the robustness of figures such as those presented by Hanushek. Firstly, defining and measuring teacher quality is hard. The attributes associated with being a great teacher are multidimensional, diffuse and largely unmeasured, which clearly creates difficulty for researchers. Second, good quality teachers are likely to be attracted to the ‘best’ schools, with bright students from supportive backgrounds and other favorable institutional features. Studies thus risk confounding the effect of teacher quality with other “good school” features, overestimating the magnitude of teachers’ impact. Yet, saying this, arguing that outcomes are independent of teacher quality is going too far. Studies that use variation within individual schools still pick up positive impacts of able teachers and common sense tells us that there is going to be some kind of link there. It should be known, however, that the strength of this link, and thus its policy salience, is by no means clear empirically. Incentive pay to improve selection Taking as given that we should raise the quality of teachers to improve educational standards, how should governments do this? Haunshek argues that incentive pay schemes will help. One can consider two broad mechanisms via which this reform may be beneficial. First, motivational: incentive pay could induce greater effort on the job, making for better teachers. This is a dead-end, as Hanushek concedes. Quality in teaching among those already in the profession is at best negligibly affected by monetary incentives and at worse inversely related. Given that performance in education multidimensional and difficult to measure, tying pay to easily observable indicators such as test scores comes at the risk of distorting energy and attention within the classroom, ultimately making for a less conducive learning environment. Think greater ‘teaching for the test’ as a probable consequence. Rather, Hanushek argues that the dispersion in rewards induced by incentive pay will induce selection of higher quality teachers into the profession. Incentive pay won’t do much for those already in the job but by paying more, and having greater differentiation in pay levels, it is thought we will attract a different kind of person into teaching. Hanushek states that the independence of pay and performance implies teaching is not thought of as a “profession” in the usual sense. Teachers do not face the same pressures of responsibility and accountability forthcoming in other careers, which puts off the most able candidates. Implicit in his argument is the idea that responsibility and recognition flows from differentiated rewards. It is then these job factors that make it more likely that able individuals will decide to become teachers. Alternative ways to attract the best. However, pay differentiation is neither a necessary nor a sufficient means of making teaching “a profession” and attracting top people. Rather than focusing on pay, I believe it is more profitable to consider transforming the structure of the job itself, building in more channels for career progression and space for personal responsibility. My perception is that, currently, if you are a teacher the broad nature of what you do day-to-day doesn’t change much over time and it is this that is off putting to top graduates; the idea of career progression is attractive for many. Thinking creatively about how to formally build in opportunities for postgraduate study and develop interactions with government and the development of wider education policy will help to attract the most ambitious. 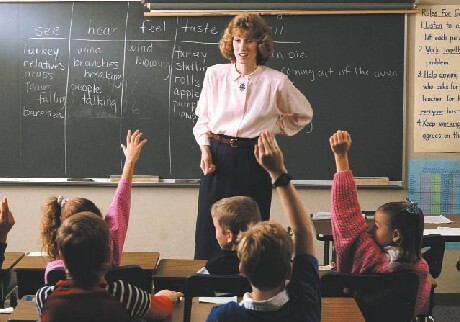 Transforming pay alone cannot turn teaching into a profession in the sense described by Hanushek. Further, although incentive pay is inappropriate in this context, performance evaluation is still obviously important in education. However, what we are measuring should change. Rather than using output measures, such as test scores, to evaluate teachers, more emphasis should be placed on “input” measures to raise teacher accountability and ‘ownership’ of their job. Moving away from simply looking at attainment to consider classroom atmosphere, pupil feedback and the quality and innovativeness of lesson plans should foster more imaginative teaching and greater responsibility, again making for a job which appeals to more ambitious individuals. Raising average quality involves removing poor teachers from the classroom, in addition to attracting the best.Thus, employment contracts in teaching must be transformed. As Hanushek notes, evidence suggests that one’s ability as a teacher stays relatively constant over time. Either you’re good, or you’re not. The use of short term employment contracts in the early years of a teacher’s career thus seem like a good way of removing those at the bottom end of the quality distribution from the classroom quickly. In conclusion, incentive pay in education is neither necessary nor sufficient for raising teacher quality. Rather than focusing on pay, I believe a creative transformation of teaching jobs, to explicitly build in greater responsibility and career progression to other spheres within the education system, is a more direct and profitable approach. More effort should be deployed considering how best to redefine teaching jobs themselves rather than their pay structure.